A message censor policy consists of a filter, an action, a time period, and level of severity. 1. Go to the Services > Message censor > Policies page. • IM proxy incoming — Applies the policy to incoming instant message content. • IM proxy outgoing — Applies the policy to outgoing instant message content. 3. 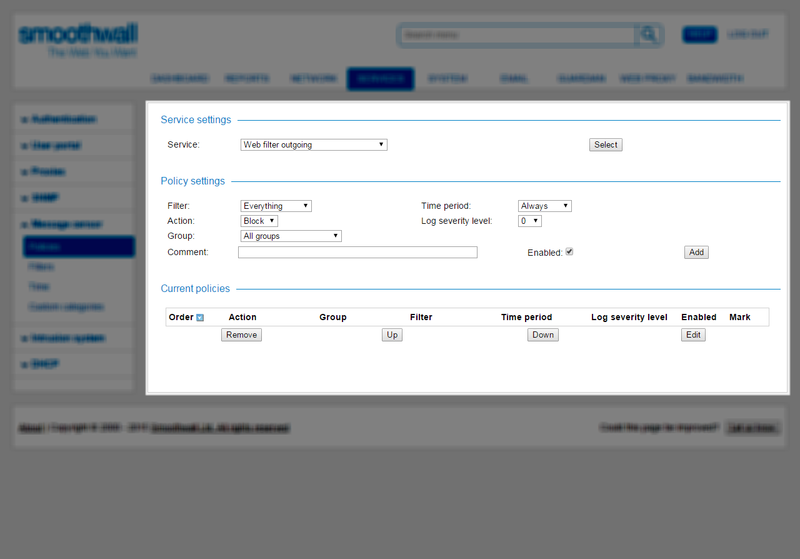 Click Select to view the policy in the Policy settings panel. • Filter — From the drop-down list, select a filter to use. For a detailed description of how to create a message censor filter, see Creating Message Censor Filters. • Time period — From the drop-down list, select a time period to use, or accept the default setting. For more information about time periods, see Setting Message Censor Time Periods. Content which is matched by the filter is discarded. Content which is matched by the filter is masked but the message is delivered to its destination. Content which is matched by the filter is allowed and logged. Content which is matched by the filter is allowed and is not processed by any other filters. • Log severity level — Based on the log severity level, you can configure the Smoothwall to send an alert if the policy is violated. From the drop-down list, select a level to assign to the content if it violates the policy. See Inappropriate Word in IM Monitor for more information. • Group — From the drop-down list, select a user group this policy applies to. For a detailed description of how to configure user groups, see Managing Groups of Users . • Comment — Enter an optional description of the policy. • Enabled — New policies are enabled by default. Clear the check box to create a disabled policy. 5. Click Add and, at the top of the page, click Restart to apply the policy. The Smoothwall applies the policy and adds it to Current policies. 2. In the Current policies area, select the policy and click Edit. 3. Edit the settings as required, see Creating and Applying Message Censor Policies for information about the settings available. When finished, click Add to save your changes. 1. Go to the Services > Message censor > Services > Message censor > Policies page. 2. In the Current policies area, select the policy or policies and click Remove.